The standard 96Boardws mezzanine includes a premium Quectel LTE modem that delivers whopping 150Mbit/s speeds. We’ve also added a 9-axis absolute orientation sensor, gesture, proximity and range sensors and a highly accurate digital temperature sensor. The Shiratech LTE and Sensor Mezzanine on top of a 96Boards consumer edition (CE) products forms a complete solution for any application that has your product moving around and sending data over mobile networks. Typical uses that require LTE connectivity and context awareness are: autonomous systems, augmented reality, IoT, navigation, robotics, fitness and well-being. 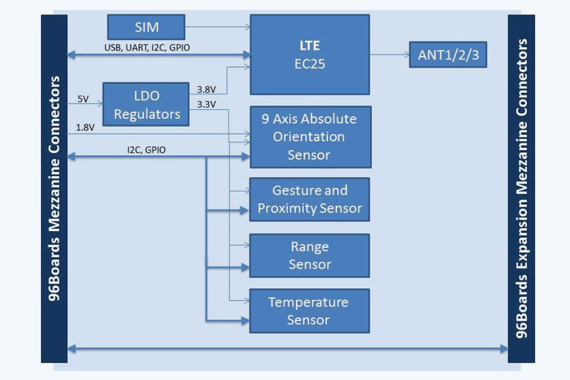 The LTE and Sensor Mezzanine can be extended with additional functionality through the built-in expansion connectors. These allow you to plugin additional mezzanines as needed. Additional sensors and peripherals, like a USB camera, can be connected to the 96board USB ports to enhance context awareness capabilities. LTE CAT 4 Max 150Mbps (DL) 50Mbps (UL). LTE category 4 module optimized for M2M and IoT applications. Worldwide LTE, UMTS/HSPA+ and GSM/GPRS/EDGE coverage. Multi-constellation GNSS receiver available for applications requiring fast and accurate fixes in any environment. MIMO technology meets demands for data rate and link reliability in modem wireless communication systems. Outputs fused sensor data – Quaternion, Euler angles, Rotation vector, Linear acceleration, Gravity, Heading. 3 sensors in one device – triaxial 16bit gyroscope, triaxial 14bit accelerometer and full performance geomagnetic sensor. Intelligent power management – normal, low power and suspended modes. Multifunction photometric sensor and signal conditioning. Fully integrated AFE, ADC, LED driver and timing core. Enables an ambient light rejection capability using both optical and analog filtering. Gesture/proximity works under infrared (IR) transparent glass or other materials. Fully integrated miniature module: 940nm Laser VCSEL, VCSEL driver, ranging sensor with advanced embedded micro controller. Fast accurate distance ranging – Measures absolute range up to 2m, Reported range is independent of the target reflectance. Eye safe – Class 1 laser device. Fast first temperature conversion on power up of 6ms. Easy implementation- No temperature calibration/correction equired by user, No linearity correction required.